This was a short stage, only 4.1 miles long, rolling to start with and then uphill for the final mile on a "well kept" but unpaved road. 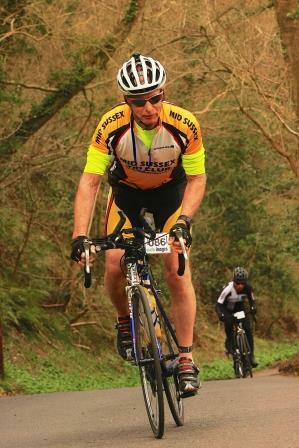 We got there fairly early to ride the course and more importantly test the off road climb. We quickly found out that "well kept" had been highly exaggerated, coming off line was treacherous and dangerous. Small boulders littered the road along with deep, eyeball rattling ruts with the only safe-ish place being the sand on the far right. This meant taking each of the corners extremely tight otherwise you could end up being thrown from your bike quite violently which I nearly found out when practicing. It seemed you would lose time by attacking this climb and bike positioning was far more important, it got better towards the top where gravel lined the road. Although short, this would be challenging and exciting due to the different nature of the course. My plan was to hit the paved section hard, recover up hill and empty the tank for the last 500 meters and it worked! I placed 1st, earning 20 points and the lead of the GC but what a strange feeling it was - overjoyed at the win, but it seemed like there was no glory. You just wait to see if your time is bettered and you obviously can't celebrate as you cross the finish line! 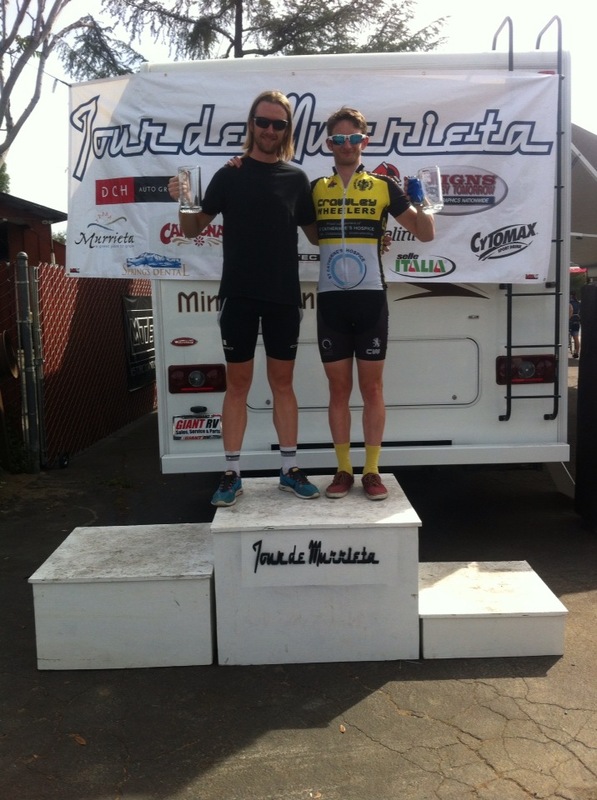 Both myself and my brother had never raced in a criterium and with 6 right angle corners over a 1 mile course it made it fairly technical. We were also both in good positions in the GC and both not sprinters, so limiting our loses and sitting near the front was the aim of the game. The race was 35 minutes long and as expected it was fast and frantic with a number of crashes, popped tires and everyone fighting for position. Coming to the last lap I managed to find myself in a strong position in 2nd wheel going into turn 2, but the rider in front overcooked turn 4 and went skidding across the tarmac causing some panic in the peloton. Looking at the course profile we felt the rolling course suited us and was ripe for a breakaway. Moment Cycles approached us and an alliance to suite all parties was made - I would secure the overall GC, John would finish on the GC podium and Moment would win the stage. The plan was sound - after 7 laps the Moment team would up the tempo, force some gaps in the peloton then sit back enabling myself, John and a couple of Moment guys to get in a brake. We were desperate for it not to be a sprint finish and felt it suited us if we went longer. It was cold at 7.30 am, very cold, but it would warm up soon towards a sweltering 30 degrees and as we rolled to the start line the commentator let us know the state of play with Festina requiring 2 points to secure the GC. Gently we all rolled out, but within 5 minutes the first crash happened with someone hitting someone else whilst climbing out of the saddle, I thought this will be a long day if this carries on! And for sure it did, a rider inexplicably cut me up which almost ended my race and half of the peloton, with his side swiping, erratic move my front wheel was taken from me, my back wheel lifted into the air but somehow to my relief I stayed upright! As planned on lap 7, Moment sent some guys to the front and the tempo was upped, but it wasnt us that made the break and instead of chancing it we sat back thinking they had broke too early and would never hold out. Little did we know though, that the 6 man break formed themselves into a strong unit and organised themselves well. Their lead steadily grew lap by lap and with time running out, Moment and ourselves were the only people interested in bringing the break back and with no other help from any team the break deservedly succeeded. The peloton was therefore left to fight it out for 6th place onwards. Going into the final four corners, the sprint started early with SDBC getting Festina into a good position, with the rest of their team (as predicted) blocking my way around I lost his wheel. After fighting passed I had caught up by the final corner but by then I had used too much energy and was unable to contest the sprint. I managed 8th, Festina 6th and the GC was his and SDBC's, no win for Moment and John secured 4th in the GC. All of our targets missed, from the high of winning Stage 1 to the low of this. But, I would by lying if I said I would not have taken this result before the race started! On the positive side, the two of us, Team Newsome outscored SDBC over the 3 days of racing, the biggest bike club in San Diego! Last year I did the Challenge Route of 85 miles and without thinking entered straightaway for this years event but thought I would have a crack at the Classic Route 107 miles! Well that year flew by and it was suddenly time for THAT ride!!! Before June I had managed to bash out a few long rides but no where near 100 miles and since June I have not had the time for various reasons to log up a long ride. So I was a little apprehensive when I arrived at the start on Hove Lawns where I met up with fellow MSTC riders Andy Miles and Jeff Woodall. Although it was a little misty the forecast for the remainder of the day looked good! Once registered we were amongst the first to set off and for quite a few miles I was able to keep up with Andy and Jeff but then they disappeared off into the distance! I won't bore you with the details of the route but needless to say there were hills involved and the ride took us out West and up to Hazelmere via various sometimes very narrow country lanes. The Classic timing checkpoint was at a place called Fernshurst and after a brief stop I began the journey back to Hove. I have to be honest there were times on the return journey when I said to myself "how much bloody further" but I managed to dig deep and eventually arrived at the foot of Devil's Dyke which was the last "big" hill before dropping back down to Hove Lawns and the finish. Well that was the furthest I had ridden in one lump for some time so I was pleased to have completed the ride and was even more pleased to find out that I had attained a Gold Standard, which for my age group was 8hrs 20 mins and my time was 7hrs 28mins 5secs which included 13 mins of timing and feed station stops. Jeff flew round in 6hrs 32 mins 29 secs and Andy in 6hrs 52mins 49secs both achieving Gold Standards as well. I used to think of myself as a fair weather cyclist. Not any more, after having battled through the back end of tropical storm Bertha. On 10 August 2014, "Team Fish-hook" (Jean Fish, Mike Hook and I), embarked on the Prudential Ride London 100 bike race. 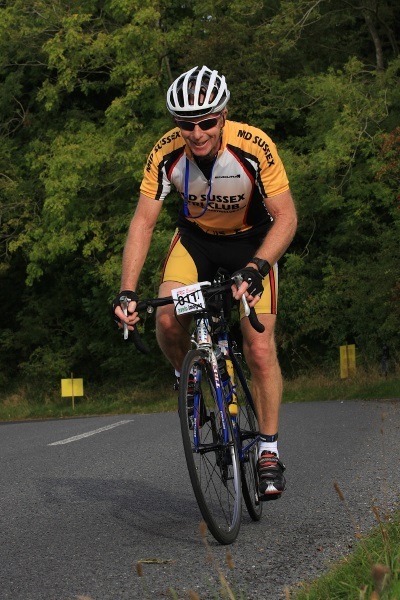 Taking in the sights of London and the Surrey hills, it is the biggest cycling sportive in the UK. It's fair to say we had been training over the preceding 2 months in the most glorious sunshine. One barmy Sunday, I even had to stop to buy sun cream. However, the weather had different plans for race day, forecasting torrential rain and high winds. When we registered at the Excel centre two days before the event there were countless people in a blind panic at the waterproof gear area. An amused worker told me they'd cleared their entire stock of jackets the day before and had had to get an emergency delivery overnight. Still, there was no rain to be seen outside and we were confident the forecast couldn't be as bad as predicted. With some reluctance Team Fish-hook agreed we would pack our overshoes 'just in case'. I don't think the reality of situation really sunk it until it was too late. We arrived at the start line at 7 a.m. in Stratford and got into our allocated wave positions. The role out of 24,000 riders from the Olympic Park was seamless and impressive to say the least. There was no rain at that point and morale was high. We were however, disappointed to learn that the organisers decided to cut out Leith Hill and Box Hill from the ride and reduce the distance from 100 to 86 miles. Little did we know what a wise choice had been made. The first 20 miles took in the sights of London, going through Stratford, the City, along the Embankment and out through Chiswick. Riding through London with no traffic lights or cars is nothing short of a privilege. It was exciting to see the Tower of London and The Eye as we sped past, and to ride under the Thames through the Blackwall Tunnel. The next 66 miles become much more of a blur in mind. Time bent to feel as though it were passing both slowly and yet extremely fast at the same time. We became acutely aware of the danger of the other swerving riders around us and our failing brakes. It was certainly novel to be cycling through puddles that were up to a foot deep and I have never avoided cycling on drain covers so intently. The aim of the day turned from racing into completing the event accident free. We devised a genius plan to locate each other in the crowd and try to stay together - by someone shouting 'Fish' and waiting for the other Team members to respond with 'Hook'. As I said, it was genius. We did have some rest-bite from the rain and enjoyed speeding along three a breast as fast as the crowds would allow along the flat of closed dual carriageways in Surrey, and having snack breaks of ISO gels, Jelly Babies and Builder's Bars. I should say it wasn't entirely flat -the climb at Newlands Corner warmed us up nicely. There were friendly crowds cheering us on as we came back into London through Kingston and Wimbledon, allowing us to pretend (however fleetingly) that we were part of the Tour de France. The ballot for Ride London 2015 opens on Monday, 18 August 2014. 93 miles !!!! seemed like a good idea when I entered months ago! Considering I hadn't ridden that distance since I rode across Australia in 2001, I thought I had bitten off more than I could chew!!! I went to bed Saturday night secretly hoping that it would be raining so hard in the morning that I would have an excuse not to ride!!! Well it wasn't raining in the morning but it was very windy as I made my way to Burgess Hill to the start [ by van as I didn't want to add even more miles!!!] . Once I got signed in there was turning back and before I knew it I was on my way. After about 5 miles it was time to tackle Ditchling Beacon, followed by a fast descent down Coldean Lane. Then it was up Coombe Road , Bear Road and onto the coast road through to Newhaven before heading inland via Lewes. The route then took us out to Laughton and continued through various villages and MANY hills heading towards Mayfield. At one point following the "arrow signs" I took a right turn and after about two miles of going down a lovely hill I realised that I hadn't seen another "arrow sign" and my fears were confirmed when I saw a sign post for Battle and Hastings!!! A quick consultation with my map and I had to ride another two miles back up the same hill I had just flew down!! As I passed the turning I had previously come out of I realised that the wind had turned the "arrow sign" completely the opposite way!!! [ or did I have a C.R.A.F.T. moment!!] Oh well I thought what's another 4 miles on top of 93.!!!! I soon forgot my mishap and was making my way to the timing chip check point at Mayfield. A quick pit stop here and then it was only another 30 odd miles back to Burgess Hill!!! The hills and wind had been relentless so far and the same pattern continued all the way back to Burgess Hill and the finish. My riding time was 6hrs 53mins 41secs which gave me a Silver Standard, missing out on the Gold by approximately 10 mins, which I reckon was the extra 4 miles I done!!!! I did this ride last year but opted for the Challenge route 54 miles, so this year I was going for the Classic route of 71 miles!! At registration I met up with Jeff Woodall, Andy Miles and Graeme Fitzjohn. Jeff and I were doing the long ride and Andy and Graeme were doing the 54 mile route. The ride started at 8.30 am from Burgess Hill, although it is not a race, everyone is timed over their respective course. The weather was kind as well, mild, a bit cloudy with a slight wind. We all started together but Jeff was after a personal best time and went off like a rocket, not to be seen again til we met up in the food hall at the finish!!! I stuck with Andy until my chain came off after I went through the ford at Pillow Mounds Hill. I don't know how Graeme and Andy got on during the ride as I never saw either of them again. The Classic route takes in Ashdown Forest and travels into parts of Kent and Surrey. There are five notable hilly sections on the route with Pillow Mounds Hill being the first, where you have to cross a ford before starting the climb. 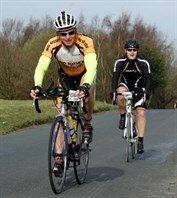 Once I got my chain back on I got stuck into the climb and completed that without any problems. The miles went by and then it was Kidds Hill, known locally as "the Wall". I have been up here several times but it is still a sit in the saddle and grind away type of hill and kicks again very steeply just before the summit. By now I was well warmed up and looking forward to the Col du Groombridge [ Groombridge Hill ], this one has no run up and must be shown respect. These hills certainly cut down your average speed!!! I arrived at Hever [ which was the timing stop ] in 2hrs 43 mins. had a quick pit stop, picked up a bit of food and was on my way again. As I was leaving the feed station I checked my bike computer but alas it was no longer attached to my bike!!! Obviously I had been travelling so fast that it must have flown off!!! Having made my way back via Hartfield , Forest Row and onto West Hoathly the next thrill to look forward too was looming up, the infamous Cobb Lane!!! It is short but has a 20% gradient and can be a cleat breaker as it's known as "the walk of shame" as many riders are forced to walk it!!! To make matters worse the official photographer is always there to record the " shame or the agony"!!! Well it was not the "walk of shame" for me but it was agony!!! Then it was on through Ardingly to what I thought was the final set of hills by the reservoir, short but steep. But there was yet another hill to climb up Deakes Lane into Ansty and then crack on to Burgess Hill to the finish. I met up with Jeff in the food hall and found out that he had problems with his bike at one of the feed stations which delayed him somewhat and that had put paid to him achieving a "Gold Standard". I've got to say that was one of the toughest rides I have done!!! I have also sent an email to the organisers to ask why the Gold Standard for over 60's was 4hrs 55mins and yet the Gold Standard for the Winter Classic [ which was 77 miles but only an undulating course] for over 60's was 5hrs 30 mins which I completed in 5hrs 15mins.